J. Bowyer Bell's Beseiged is built on the premise that as long as men have constructed walls, other men have tried to scale them. From ancient Jericho and Joshua's trumpet to London and the onslaught of the Luftwaffe, people have always devised cunning weapons, with all the skills at their command, to breach such barriers and invade the camps and fortified places of their enemies. 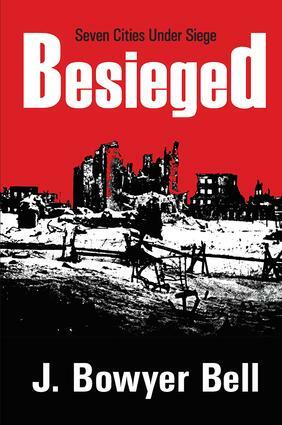 Beseiged is the story of seven great modern sieges: Madrid in the Spanish Civil War; London, Warsaw, Singapore and Stalingrad in World War II; Berlin during the Post World War II Airlift; and Jerusalem under Arab attack from four sides in 1947. Bell, a veteran historian, describes in detail the actual battles involved, clearly demonstrating the universality of sieges and siegecraft and showing that all these beleaguered places have things in common and obey certain basic laws or principles. Bell points out commonalities showing, for example, though no bullets were fired during the Berlin Airlift, the city itself was as much under siege as was Warsaw, where the Polish Underground fought a fierce but hopeless battle against Hitler's Wehrmacht. By the same token, Bell shows though no German infantry ever came close to London, it was nonetheless besieged by aerial squadrons just as surely as Stalingrad was by both German and Russian ground forces. The histories of these sieges are ones of heroism and cowardice, meticulous planning and incredible blunders, all of which can be studied and used even currently in similar situations in either defending, or piercing the defenses of, a location in times of unrest or war. Beseiged is a must-read for those interested in modern conflict pondering the enigma of human endeavor in wall building and breaking involved in siegecraft. A must-read for everyone from military strategist aficionados and historians to science and technology buffs. If it is to be believed the danger of not knowing history is the possibility of unknowingly repeating it, then Beseiged should appear on all required reading lists.